Another long day, but in a very different way from the one before. We had a long crossing today, fifty nautical miles from Santorini to Astypalaia, on an Aegean Sea that showed us its powers. Whipped up by an unrelenting northern wind, it gave us big waves, nearly at a right angle to our course, making our voyage a choppy one, with the guides and guests sitting atop the gulet’s fly-bridge to observe the foam-flecked waters we were crossing. Our boat, the Aegean Clipper, is a strong one and our captain is both calm and experienced, so it was a reassuring pleasure to watch him navigate us over crests and through troughs in a most relaxed manner. 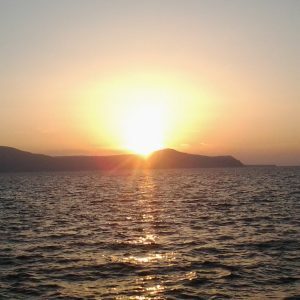 We passed close to the small island of Anafi, which is sometimes our last stop in the Cyclades, but as our itinerary says: ‘conditions permitting’. Today, they did not permit. Instead, there was time for reading, chatting, dozing and observing. Eventually, we reached much calmer waters to the south of Astypalaia, a remote and butterfly-shaped island (look it up on Google Maps) that is technically part of the Dodecanese, but that actually sits halfway between that archipelago and the Cyclades. It is a remote place, barren and dry in appearance, but its ragged outline makes it the home of many bays and coves, in one of which we spent the middle of the day, including the chance for a swim. In fact, we were just behind the Chora, the island’s main town, overlooked by its grand Venetian castle. In the late afternoon, we rounded the headland to moor below the Chora, which was the object of today’s exploration. It is a bright and calm and beautiful place, a labyrinthine village of the eighteenth to twentieth centuries, with starkly whitewashed houses lining twisty stepped lanes, shaded by flowering trees here and there. 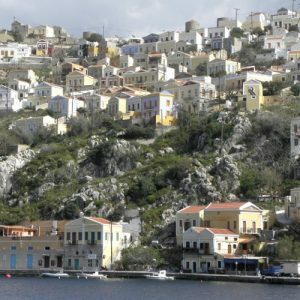 Altogether, the place is quite Cycladic in character, dominated by the same whites and blues as, say, Amorgos Chora or Parikia, rather than the colours of Pothia or Symi. Astypalaia may be less stunning than Santorini, less spectacular and far less well-known, but it is every bit as pretty in its own way, and much more authentic, a far cry from the masses of visitors that throng its western neighbour. Its lanes breathe that same calm and joyous serenity that is characteristic of so many Cycladic island towns, places that may appear remote and isolated on the map, but that were built by proudly outward-looking merchants and sailors who made their home towns welcoming and alluring gems dotted around the rocky islands of the Aegean. The crown of Astypalaia Chora is the castle, built by the Venetian Querini clan in the fourteenth and fifteenth centuries, atop the remains of an ancient acropolis, of which only spolia remain. Stark, grey and abandoned from the outside, it is an oddly enchanted place, especially in the late afternoon, when it fills with a golden light, reflected off its two blue-domed churches. The views from the castle are breathtaking, encompassing the rough and rocky slopes of the island itself, surrounded by unbelievably blue waters stretching towards the horizon, the near shore dotted with tiny islets. Our guests had a great time up there, entertained by the views and by the stories of the island’s history and mythology that Maria and I told them. The Cyclades have some of the most popular islands in all of Greece to visit, such as Santorini and Mykonos. 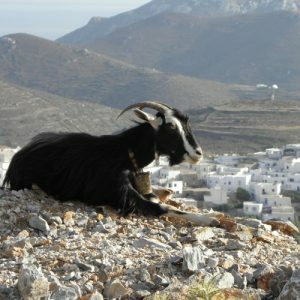 However, there are other islands in this group that are also worth traveling to such as Amorgos and Symi. These islands are also close to one another and also make for great day trips.